One of the most accessible. I know that not all of AJ's collection made it into this collection but even a small portion is a wonder to look at. Please post link and address of any lock museums you know about. This list above is just to get this started. Includes only a very small number of locks, nineteenth century and modern, by local manufacturers, including Edwin Cotterill (lock patentee) of Birmingham. Approximately 35 locks and lock plates, circa 200 keys, mainly from fifteenth to nineteenth centuries, English and German. Privately owned collection of mechanical models and inventions acquired and constructed by the late Randolph Douglas (1859 â 1956) a professional model maker. 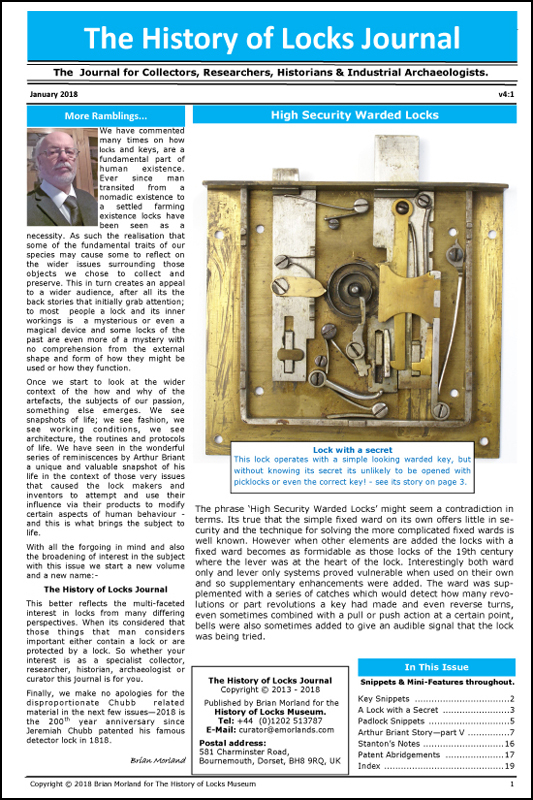 Douglas was especially fascinated by lock mechanisms and the collection, entitled 'The House of Wonders', includes a working model of a miniature safe and several cases of locks and keys; model of the Egyptian lock, Roman examples, medieval and nineteenth century patent inventions. A short article on the museum appeared in Derbyshire Countryside 24(3) April â May 1949, 22, 31. Approximately 300 locks and keys, from the twelfth or thirteenth centuries, and several Roman and Viking examples. Almost entirely Scottish. EDINBURGH. THE ROYAL SCOTTISH MUSEUM. The Castle, Chambers Street, EH1 1JF 0131 247 4219 Department of Art and Archaeology. Approximately 50 locks, some circa eighteenth or nineteenth centuries, but mostly seventeenth â eighteenth century. About 60 keys, circa fifteenth to nineteenth centuries, but mainly seventeenth. English, French, German and Italian. Eight locks, rim (including spring action) English; seventeenth to nineteenth centuries. Three padlocks, circa seventeenth century. 150 miscellaneous keys (including items for cellars, safes, wine barrel taps); set of 11 skeleton keys; circa 35 medieval keys; few Roman examples; rest are from fifteenth to nineteenth centuries. Three eighteenth century door locks, six padlocks, all English circa 1750 â 1900. One Spanish lock, sixteenth century. Keys: a few Roman and Medieval, sixteenth to eighteenth centuries; large quantity of nineteenth century keys. Circa 180 Roman keys and 200 medieval â post medieval keys. 100 locks and padlocks, mainly fragmentary. The new Lock and Fastenings Gallery, opened in late 1972, contains a fine representative collection of locks, with particular emphasis on mechanisms and security. The wall cases contain panels showing the whole history of locks from ancient Egyptian examples to modern magnetic locks and springless detainer mechanisms such as the Finnish 'Abloy' type. Other locks include those by Barron, Bramah, Chubb detector, Parson's (balance lever), Yale and combination locks. There are also full size reconstructions of a shop window similar to that in Piccadilly occupied by Bramah and Company, lock makers, in the mid nineteenth century and a locksmith's work shop such as would have been used by a Willenhall craftsman in the last century. A list of photographic negatives of the collection was made available in April 1973. The national collection of fine and applied art of all periods, countries and styles, and as with other objects, the collection of keys and locks is too extensive to enumerate. Photographs are available from a master file of negatives and the collector is frequently quoted and illustrated in books and articles dealing with the antique and artistic aspect of locks and keys. Small collection of European keys, sixteenth to seventeenth centuries, one sixteenth century Italian lock. Small collection of seventeenth and eighteenth century keys (Thompson collection) mainly English, but a few European items. Possess one of the largest and most important collections of medieval keys, discovered during drainage operations at Salisbury about 1850 or 1860. Thirteenth to seventeenth centuries. Item 310 gives a full description of the collections. Miscellaneous collection of medieval keys, English and European locks and keys, seventeenth to nineteenth centuries. Small collection only, mainly nineteenth century; circa 24 keys, 3 locks presented by John Mattox and Son, lock makers of Wednesbury and discovered in the locality. No catalogue available. Originally opened in March 1962, by the then Willenhall Urban District Council, and reorganised in other premises in 1972 by Walsall County Borough Council Libraries and Museums Staff, being officially reopened again in November 1972. Separate cases showing examples of locks by Barron, Bramah, Chubb and Yale, models of a lock maker's forge and the wooden pin tumbler Egyptian lock; brass rim locks from St Giles Vicarage, renovated by Josiah Parkes Limited, locks by Carpenter and Tildesley, one of the oldest firms in Willenhall; examples donated by C Spencer Esquire, and Herbert Spencer (a craftsman locksmith); prison and other patent locks by J T Dancer of Wednesfield (circa 1920 -â1936). Working model of a modern pin tumbler cylinder lock by Josiah Parkes Limited. Also extensive library. From 1 May 2003 management of The Lock Museum was taken over by the Black Country Museum Trust and is open on Wednesdays and Saturdays from 12 - 4p.m. Admission prices are £2.50 for adults and £1.50 for children and concessions. Costumed demonstrators are on hand to offer visitors the opportunity to experience the living and working conditions of the Hodsons, who were a typical Willenhall lock-making family at the turn of the twentieth century. Curriculum targeted educational programmes are being developed and are available for booking by schools. For further information: Black Country Living Museum. Ann Key, Senior Demonstrator, The Locksmith's House. Important large private collection owned by one of the country's leading lock manufacturers. Mainly English and European, sixteenth to nineteenth centuries; working model of wooden pin tumbler lock. Many items illustrate the detailed workmanship and intricate mechanisms, eg the 'box of wards' type of lock. Most of the collection is included in a catalogue of the museum published in 1955 (item 190). Current locks in production are also on display. Collection seems to have disappeared and the only hint is that it might be in Scotland. The paper archives are goung to a museum soon. Small collection of locks on loan from Snowshill Manor, Worcestershire; English, seventeenth century. Undocumented and unclassified collection of keys owned by the Museum itself. Fairly large collection of locks and keys, late seventeenth to early eighteenth centuries, but entirely unlabelled and unclassified. General collection of about 220 keys and 3 locks, displayed in the gallery containing domestic bygones. The keys, mainly sixteenth to late nineteenth centuries, include examples from a church door (seventeenth century), chests and coffers (sixteenth to eighteenth centuries), ceremonial keys, double bitted skeleton keys, keys with split stems, Georgian and Victorian door keys. Prison, court, police station, handcuff display and library by appointment. Shanghai is not, perhaps, the most obvious city in which to look for a museum of keys, but a short walk from the railway station to the south east will take you to just such a place. It is located in the Everbright City Commercial Building on the corner of Tianmuxi Lu (meaning road) and Meiyuan Lu, opposite the East China Hotel. Once inside the building, don't be put off by the shoe sellers on the first three floors but take the escalator or lift to the fourth floor (which the Chinese call the fifth) where you will find, among the stamp dealers, the museum (tel: 63542597) in stall No. 501. It's open Monday to Friday from 1.30pm to 6pm, but these times might vary. The museum consists of two small rooms full of interesting old keys and one or two early padlocks. They are all attractively set out in glass-topped showcases with some labelling in English. The earliest key exhibited is Roman and would have been worn on a finger. Not quite so old, but nevertheless thought to be the earliest Chinese key, is one made in the Tang dynasty in 731. Also on show are what the museum's founder, Zhao Jin Zhi, claims are the largest and smallest working keys in the world. The largest weighs two kilograms and is over 30 cm long, while the smallest is inscribed on a piece of hair and has to be viewed through a magnifying glass. One of the wall-mounted displays represents a giant key made from 1666 pin tumbler keys; others show smaller groups of keys in artistic arrangements. Also exhibited are examples of Zhao's calligraphy in which he has incorporated key motifs into the Chinese characters. How did Zhao become a key collector? His late father sometimes traded in waste metals and would occasionally come across interesting keys which Zhao inherited. Over the years he has added to these, and in 1988 set up a small museum which took up one room of his two room flat. Five years later he moved the museum, now much enlarged, to a new restaurant in Pudong, a rapidly developing modern suburb in east Shanghai. The opening ceremony took place in November 1993. Then, in October 1997, the museum moved again to its present home in the Everbright Building at 188 Tianmuxi Lu. Here Zhao, who claims to be one of the world's ten greatest collectors, can show some of the 15,000 keys he has amassed over the past forty years. It was just by chance that I discovered the Golden Key Museum, so called because the first part of Zhao's given name, Jin Zhi, means gold. Early in November I took a two-day break from teaching English to PhD students at one of the universities in Hangzhou and visited Shanghai, about 120 miles away. In the Peace Hotel I picked up a copy of the Shanghai Star, published twice weekly by the China Daily, and, turning to the back page, was surprised to find a half page article 'Collector unlocks his trove of keys'. This was about Zhao Jin Zhi, a retired clerk aged 56, and his museum. As my knowledge of Mandarin is non-existent, finding the museum proved very hard, but eventually I succeeded, and was shown round by the manager of the building as Zhao wasn't there. On a subsequent visit to Shanghai Zhao himself gave me a conducted tour, after a Chinese friend had made an appointment for me to meet him. I am a member and never knew that. Copied your post here to the sticky. Last edited by Dean Nickel; 02-12-12 at 03:42 AM. ALOA's Robert Bell museum was started by Mr. Bell in the late 1970's IIRC. The colection is made up exclusively from donations by members. they are very nice indeed, dare I say ... pretty. There is a preserved shop of a locksmith in the museum, inside the castle at Acre, Israel. Any pictures or further info?